Hello everyone, i'm here to explain the system of the style bar, how it works and how to rank up. There's a common misunderstanding, most of people think that you have to get fast 2ks to get SSS, and you have only to deal massive damage to rank up...well, you can get SSS quickly even with 1000-1200 damage, i also had a run when i got 34k on the style bar and 1.6k was the max damage (which means, speed killing > damage). So let's see how the style bar works. First of all, let's talk about The style points. 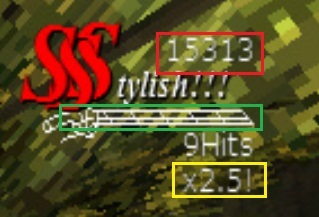 The Style points are points that you get each time you deal a damage and they are related to the damage that you've dealt. Style points = damage + 200. For an example, if you deal 800 damage, you will get 1000 style points. But, what does that have to do with speed killing? If you keep attention to the bar, you will see that it keeps decreasing each time, so if you waste time spinning around trees to get damage, you will lose many style points, so if you lose 2200 style points while spinning and then you hit 1.8k (2000 points), you will be like wasting 200 points and your effort goes in vain. Now let's get to the most important thing, The multiplier. The multiplier is the key to rank up, you can see it under the hits, how it works? And if you keep getting each kill in 5 seconds(exactly) or less, you will get x2.5 multiplier, so if you hit a titan with 800 damage (1000 style point) in 5 seconds or less, you will get 2500 style points because it's multiplied by 2.5, which equals 2300 damage!! BUT, if you kill the next titan in more than 5 seconds, no matter what you have on the multiplier, it will get back to x1. That's why you should focus on getting fast kills instead of focusing on dealing damage after spinning on trees, fast kills doesn't have to be 1k+, you can even get the SSS with 500 damage average, BUT you have to be fast. Now, here are the ranks of the style bar, and how many points you need to get for each rank.